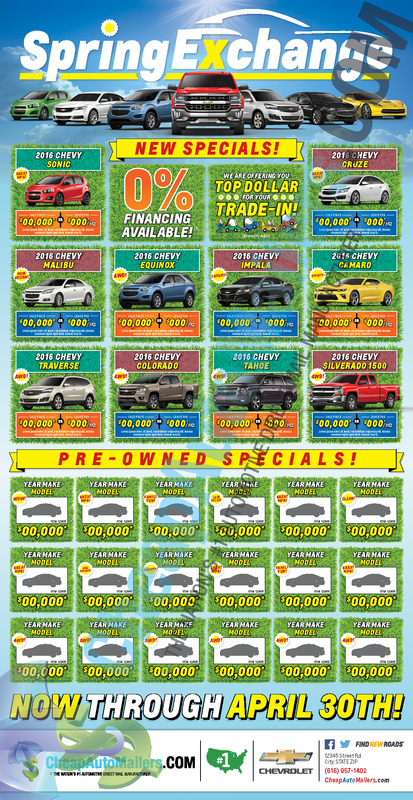 We have several popular automotive direct mail promotions going on in the month of March. A lot of orders have been coming in for our March Mania mailer. Also, still seeing many Tax time promotions come through for this month. With the weather warming up in many parts of the country, our Spring Exchange mailer is sure to increase traffic and bring a solid marketing message to your local customers. Spring Exchange comes in many sizes including 9x12, 17x22, 34x22, 8 Page and Envelope Fold Ups. Effective Automotive Direct Mail at wholesale prices. We handle every facet of your mailer start to finish so there is no confusion, no late mail and most importantly no funny business. Agencies, dealerships, and dealership groups all have found a value in using our services on a regular basis.